Selfies bring out the best in you, experts say. “By offering different aspects through images, we are sharing more of ourselves, becoming more authentic and transparent—things encouraged by digital connectivity,” she added. Instagram has over 260 million #selfies to date. An average millennial spends more than an hour each week to snap selfies and may take up to around 25,700 selfies during their lifetime, a 2015 study by Frames Direct and Now Sourcing, showed. “This makes [the selfie] ripe for exploration and identity experimentation, particularly among ages where identity formation and emancipation are key developmental milestones as well as for those who are just interested in looking at themselves,” she added. Defining one’s identity is a human pursuit. Since the Ancient Greeks, people have been observing themselves to gain a sense of self, she added. Dr Mariann Hardey, a lecturer in marketing at Durham University, said in an article on The Guardian, "The selfie is revolutionizing how we gather autobiographical information about ourselves and our friends." "It's about continuously rewriting yourself. It's an extension of our natural construction of self. It's about presenting yourself in the best way … [like] when women put on makeup or men who bodybuild to look a certain way: it's an aspect of performance that's about knowing yourself and being vulnerable," Hardey added. The study found that 65 percent of teen girls and 41 percent of adult women “feel more confident” when they see selfies and other flattering photos of themselves. Selfie, however, is not all about presenting one’s “best self” but also one’s quirks and flaws. “OPPO has established itself as the ‘selfie expert’ and a leader in smartphone photography. Research indicates a strong consumer recognition that ‘OPPO shoots great,’” he said. Bloggers’ Style Camp is an artist building fashion photography competition where GMA artists and the Philippines’ top bloggers come together to create photography layouts which embody a certain advocacy. I seldom do facials, so seldom I can't even remember the last time I did. Why? Facial spells pain for me, I was traumatized many years ago when my mom encouraged me to do so, ugh let's not go into details about the past, let's move on because I think I found a better place for our facial needs. Say hello to Piel Acne and Skin Center who invited me to try their services, I was a bit hessitant at first because I thought facial services were all the same but because I was informed that there will be a skin analysis before they'd do anything to my face, I felt comfortable so I said yes, let's try and see. But first, who is Piel? Nope not a person nor the owner, Piel means face in French, yup they specialize in Acne, those stubborn little friends on our face. Piel's main branch is actually in New York, USA and is owned and managed by Ms. Sylvia Cancio who is a licensed Aesthetician and an Acne specialist. Upon entering the clinic, I felt relaxed because the staff were all ready to explain and answer our questions, I was secured that they all knew what they were talking about and I admire their passion in seriously taking care and knowing what to do with our faces. - This is the part wherein they clean our face from make-up, excess oil and dirt. - In toning, they put the toner to relax our skin and prepare it for skin analysis. - This is the part I like most because for the longest time I didn't know the condition of my skin that everytime I was asked if I was oily or dry or normal I gave a blank stare hence having wrong products to put on mine. This time I am now confident to say that my skin is a combination of dry and oily, I am now aware thanks to Piel. - This is done to remove dead skin cells which can't be removed by daily ordinary facial wash. This is tickling because they used a razor looking like machine, (I forgot the name because I was too relaxed lol!) I will let you know once I recall the name of the machine, but this procedure was not painful at all, and felt all the dirt from my skin was carved away. - The triple collagen mask was coated on my face, it has a cool feeling since it has mint to help reduce too much oil on my face. An eye patch was also placed on my eyes to protect it when the steam was released for more relaxation and I was able to nap for 20 minutes. The mask was removed after using a cloth rinsed in hot water and it was so relaxing I even asked for another round of hot cloth on my face lol! The experience was superb, it was really a pampering experience that I need not worry of the pain, and one thing more thing I liked about the people from Piel aside from being knowledgeable in what they do is that they ask questions about your health, in my case I am diabetic so there are procedures that can not be done on me and they will adjust. What a refreshing experience, this could be a regular thing for me and might bring along my mom to try it too the next time. So if you want to feel pampered nd secured that your face will be taken cared especially your Acne problems or just a regular facial cleaning visit Piel Acne and Skin Center located at the 2nd flr of Makati Place Alphaland, near RCBC plaza and Makati Fire Station, very accessible for commuters like me, just one bus ride from Edsa. Let me know tour thoughts when you visit. Our dear Nadz was seen in a photo on the Facebook group page of UBER Rider and Friends (I am a member of that page because My family are UBER riders as well) So while browsing through my regular feed I saw a post from one of the Uber driver/partner stating "Hulaan nyo sino kasama ko?" And that he already reached his quota and ready to go home because maybe for him, having Nadine as his rider was enough for the day. So nice of Nadine to accomodate a photo op with kuya, but wait, isn't his boyfriend James Reid endorsing Grab? Oh well, but still Kuya is so lucky to have Nadine ride with him naman. Nadine Lustre Goes UBER On! Mention Korea, I think of fashion. Yes, I am specifically amazed by the fashion sense of Koreans, on how they could mix up wardrobes but still comes out as a fabulous ensembles plus the fact that their body is of the petite-slim kind of type. And that made me worry a bit when I was invited for their soft opening and was given the privelege to shop, will I be able to shop for my body type? So I got curious and immediately checked their Instagram account @MallOfKorea to have a glimpse of what they were offering, and there it was, I had a sigh of relief, the minute I saw that there were clothes for kids, I giggled (the mom in me lol!) I said nevermind that I won't be able to get clothes for myself, kids clothes means love! Mall Of Korea has a big floor area, it was fun browsing through their clothing line and sale corner, to think the coffee shop and other areas were still being renovated, it is indeed a shop till you drop experience. Remember I said earlier that I'll be getiing clothes for my little one, tough decision, who would've thought that there were pieces that fitted my plus size-well loved body, I got a jacket, sleep wear, a pair of jeans and sando-shirt for the hubby, oh well our lil' boy still got lots of clothes pa naman lol! Anyway, the shopping was tiring but exciting and I want one of you, yes you reading this to experience Mall Of Korea by treating you to a total cash card of Php1,500 (in denomination of 5pcs 300 cash cards) shopping spree courtesy of course from Mall of Korea. Easy peasy way to win, how? 5. Comment DONE on this blog post. Super easy, entries should be in by July 27th and announcement will be done via this blog. Céleteque Dermo Celebrates 10 Years of Skin Health With The Promise of Making You DermoBeautiful. promise latch on transformation? Does it commit to worlds beyond your reach? For skin-favorite Céleteque Dermo, the answer is quite clear. With products co-created with dermatologists and curated by beauty experts, Celeteque Dermo grounds its philosophy on the dermatological proposition that beautiful skin, and in turn overall beauty, starts with healthy skin. If you want to be even more DermoBeautiful, Céleteque DermoCosmetics takes things a step further, promising expert color and cover through a line of cosmetics that combines the enhancing touch of makeup and nourishing benefits of skin care. The line offers everyday makeup that not only complements your skin care regimen but also enhances it. In as far as beautiful skin goes, nothing quite beats standards that rely on derma-level skin health. After all, healthy skin is beautiful skin, and beautiful skin is the cornerstone of being beautiful. Truly, the future is only more #DermoBeautiful with Céleteque. Because my one year old is now super active in terms of walking and sometimes trying to run (feeling nya kaya na nya lol!) aside from his milk and water I see to eat that he has snacks in between his regular meals but what can we actually give for snacks? May I share with you what I opted to have for his snack time, this is Organics Happy Baby Super Food Puffs what we have is the Strawberry and Beet flavor and no I am not into pure Organic eating for my little one. Well for starters we were buying his baby food at 6 months old from Healthy Options and he loved it until he outgrew them and would just want to join us on our regular meals (which made me an inventor to create meals which has vegetables etc, maybe to feature on my next post) so anyways, I did bought this just because I don't want him to be exposed this early to regular junk food or chichirya that is too salty and not healthy at all. The price may come off a bit hard on the budget it is about Php250 but we give him this in moderation, when he is bored or hungry and not in the mood, his snack perks him up and excites him again. Healthy Options carries a lot of baby and toddler food that may seem expensive at first but the quality and quantity will go a long way, believe me I am a mom who keeps track of the budget. Try other flavors too, next time we'll get the yellow, ornge or purple packaging (not sure of the flavors lol!) but will surely write about them or update this post when we have it. As my husband would usually say when I am in doubt because it is kinda pricey "all the best for our baby". What Do I Give for Snack Time? Who among you moms out there is having a hard time convincing your babies to drink water? My baby boy is 11 months old and since he is already eating soft solids, water should be practiced too. I tried putting water on to his milk feeding bottle to play pretend that it is milk but of course he knows, tried using the magic spoon and ended up spilling water because he knows it is water, and I also did try to use a new medicine dropper just because he loves to drink his vitamins, he might think water is vitamins too, but no, he dosn't like it as well. So how did we get him to drink his water? My husband one time was drinking his waster when our little boy tried to get hold of his glass, my husband thought of trying to give him water just for the fun of it, an 11 month old baby drinking from an adult glass. Surprisingly baby was enjoying his glass of water and was drinking fast, my goodness of we have known earlier that he wanted to do what we were doing, I spared myself from stressing over how to make him drink water, super funny! So now that he is 1 year old, we have this tiny bowl where he drinks his water, assisted of course since it is shallow and we can easily see and control how the water comes into his mouth because sometimes he gates all too excited and kinda choke himself of water. I am not sure is this helps but it is part of our experience and so we just wanted to share it with everyone who might drop by and read. Thank you and till our next discovery. Does his name ring a bell? This handsome young man is the son of no other than our Pambansang Kamao and now Senator Manny Pacquiao and wife Jinkee Pacquiao. Blue Water Day Spa welcomed Jimuel Pacquiao as one of the newest face of the brand in a recent presscon held in Makati. Jimuel is still very shy of course compared to his parents who are very much comfortable in the limelight but is suitably charming and has that mysterious kind of aura that one would actually be curious to know him more. 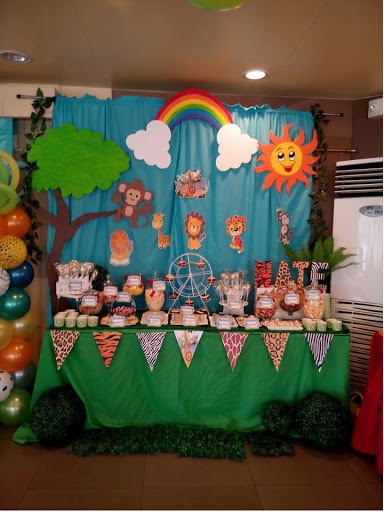 As a first time, hands-on and party planner mom my excitement was focused on creating the party for our baby boy's first birthday, but it was easier said than done. So first up was the venue, I searched through a lot of websites and did some research but ended up exhausted because venues are very expensive or not within our budget I guess. 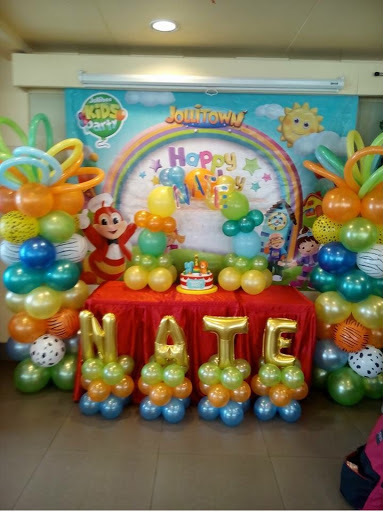 I have been wanting to create a "we have it all" kind of party, meaning, balloon set-up, themed stage, small chairs, buffet, magicians, performers, food carts, the works! It was way out of our budget plus come to think of it baby boy will just be wondering what is happening right? Anyway, enough of day dreaming, so we started to focus on being practical and counting guests (hardest part lol!) and to creating our menu. 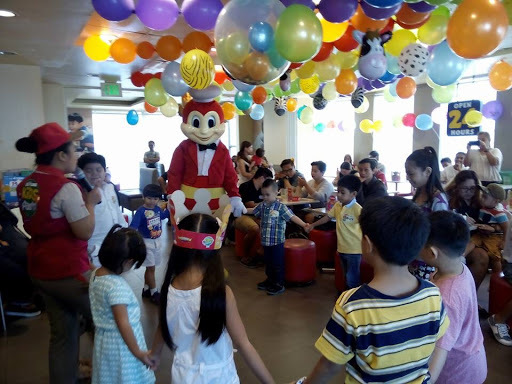 We decided to do Jollibee Kids Party, I am an OC person when it comes to details but I realized it is harder now that I have the bulilit to to take care of, so for this party I give up my oc-ness and let the suppliers do the stressing haha! Faye's Balloon was our choice out of the possibly handful of suppliers that I checked out online together with their Facebook Page. Why? Simply because the owner is very prompt in answering queries through chat, so you see if you put your business online, make sure to have someone ready to assist anyone who drops by for some queries. I haven't tried their desserts but I did base our decision from reviews of the people they have worked with, oh which reminds me I should do mine too. True to their words of creating pur event special, the dessert buffet was the talk of the party, some even thought that I was the one who did the set-up but told them about Faye's Balloonn and how good they were and did not give me an inch of stress at all. It was indeed a good and yummy decision. You may search them on facebook for your inquiries. This was non-negotiable, I can not take this part away from me lol! I love creating loot bags period. What we have inside our loot was a drawing notebook, a piece of pencil, a colored pen, and a set of small colored pencils and there you go a good back to school kind of loot for the kids. From our wedding to our little one's baptismal, we always try to be practical eventhough for some it seems weird but hey rather than having stuff you don't really need. For our baby's baptismal last January, we asked our Ninongs and Ninangs to gift our little one with educational or musical toys because we have so much blessings of hand-me-down clothes from cousins and friends. For his first birthday, I was not planning on asking in particular, I figured it will be awesome to be surprised by their gifts, but a few weeks into the party, friends and family are messaging me asking if we have a wish list, that get me to thinking that even they are having a hard time figuring out what to gift for our baby. And so I thought, he has toys, clothes etc. Hmmm what could we probably put on the wish list? And then the thought bubble came in, his daily needs, that would be perfect so I immediately snapped a photo of his Diaper (Drypers, we asked for one size bigger so we can stock it), baby wash (Human Heart Nature), and baby wipes (Pigeon). Good for a top 3 list, sent them over to our event page on FB and informed everyone if they wanted to get those as a gift, it will be very useful for us. Update: we got loads of them and practically it was the best wish list I ever did lol! 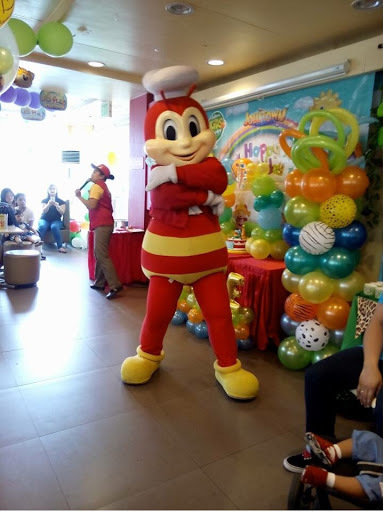 Yes I may have not have achieved the party type that has been running through me eversince, but what's important is, we had eveyone together in one place celebrating our precious gift which is our baby boy. Maybe I will try to do that on his 7th Birthday, at least by that time he will get to enjoy his own birthday as well. After a series of teasers on social media about a new addition to the Grab family, leading transport app, Grab Philippines, has officially announced Fil-Australian singer, actor, and model, James Reid as its latest celebrity ambassador.
. As the newest celebrity ambassador of Grab, Teen Heartthrob James Reid is excited to surprise fans and lucky winners of the promo when they book and use the promo code JAMES. Grab is Southeast Asia's leading ride-hailing platform. We solve critical transportation challenges and make transport freedom a reality for 620 million people in Southeast Asia. Grab began as a taxi-hailing (GrabTaxi) app in 2012, but has extended its product platform to include private car services (GrabCar) and last mile delivery (GrabExpress). Grab is focused on pioneering new commuting alternatives for drivers and passengers with an emphasis on speed, safety and reliability. The Company currently offers services in Singapore, Indonesia, Philippines, Malaysia, Thailand and Vietnam.